Little architectural effort is typically spent on public restrooms – they’re perfunctory, with looks reflecting embarrassment about the functions carried out within. 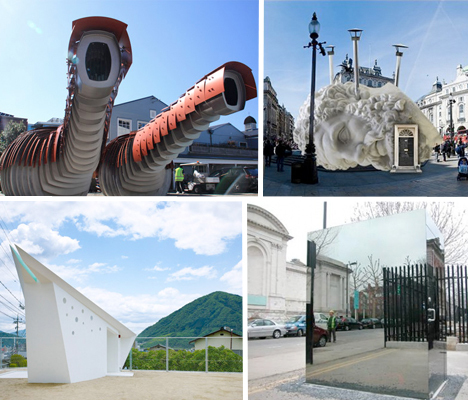 But they’re a necessary part of every city, and, as some architects have proven, they can stand as impressive landmarks, conversation pieces and works of public art. These two headless dinosaur things in Wellington are actually – believe it or not – public restrooms. 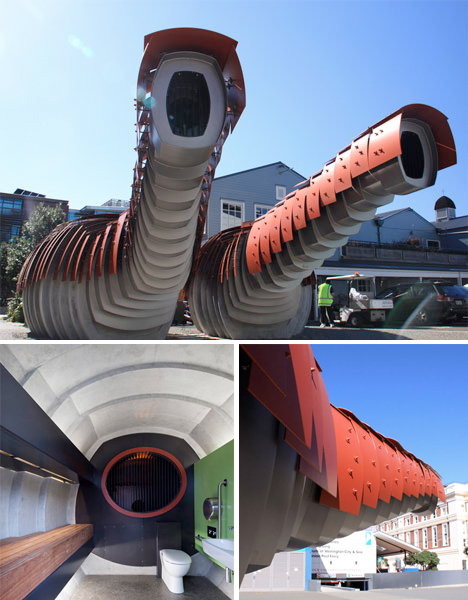 Studio Pacific architects took their inspiration from “the crusty saltiness of the sea” in the nearby harbor, comparing the structures to crustaceans or sea creatures, though they call to mind armored slugs. Each one has a concrete base containing one accessible public toilet, while the cantilevered appendages provide natural ventilation. We’ve all had this nightmare: needing to use the restroom, and having no place to go but in front of a room full of people. 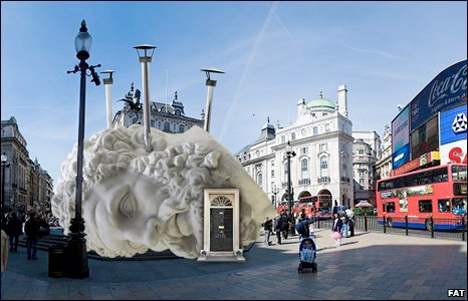 Artist Monica Bonvicini has recreated that feeling, but without actually requiring indecent exposure, with a glass cube restroom outside London’s Tate Britain gallery. 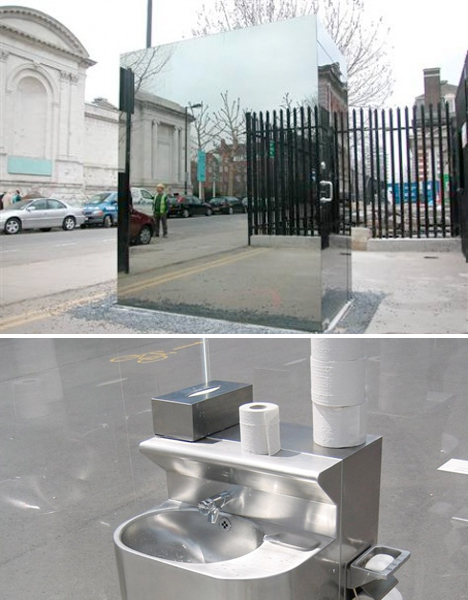 The work, called Don’t Miss a Sec, is based on prison bathrooms. It’s mirrored on the outside, but from inside, it feels like you’re on display. 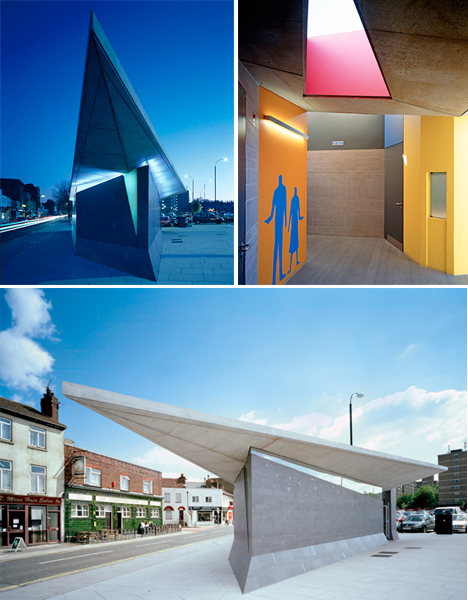 The Gravesend Public Toilets features a pointy prow rising up into the sky as a ‘minor landmark’ for public convenience, as requested by the local council. The toilet likes along a new public footpath linking the heart of the town to public park land, and is shaped according to the topography and geometry of the site. 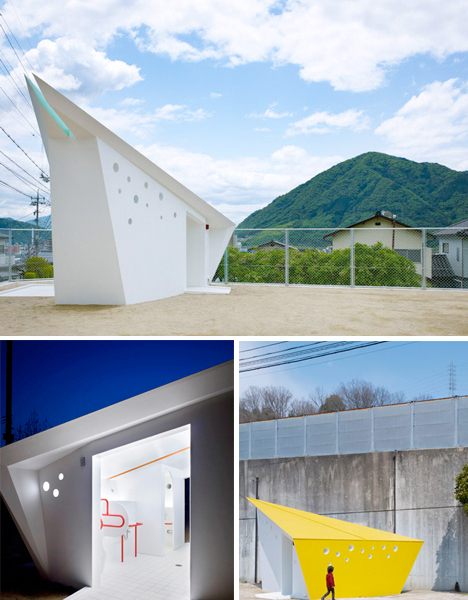 A colorful series of structures located throughout the city of Hiroshima are public restrooms inspired by origami cranes. The concrete facilities are dotted with round ventilation holes and acrylic windows to let in air and sunshine. There are seventeen in all, each one pointing in the same direction, with the entrance moved to various sides as needed at specific sites.